On June 29, 1960, President Dwight D. Eisenhower, National Grange President Herschel Newsom and over 1500 Grange members from across the country were on hand for the dedication ceremony of the National Grange Building located at 1616 H Street, NW in Washington, DC. A 50th Anniversary celebration and rededication ceremony, including tours of the building, is planned for June 2010 honoring this historic occasion. 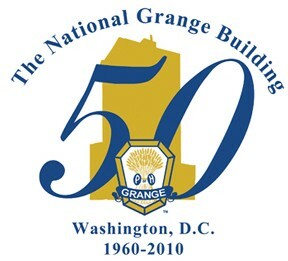 The National Grange Building Rededication Ceremony will take place on Saturday, June 26, 2010 at 1:00 PM at the U.S. Chamber of Commerce Hall of Flags located at 1615 H Street, NW, Washington, DC. National Grange Building Tours will take place before and after the Rededication Ceremony at the Grange headquarters at 1616 H Street, NW, Washington, DC. Tours will last approximately 30 minutes. Groups of a maximum of 15 people will begin tours every 15 minutes. Tickets to the tours and ceremony are free, but space is limited so advance reservations are required. As part of the celebration, a special Junior Grange and Youth and Young Adult program will take place June 24th through June 27th. This program includes lodging at the 4-H Center in Chevy Chase, Maryland, a meal package, in-town transportation and museum/monument tours. To celebrate this special event the National Grange is offering a limited edition commemorative hand pressed glass souvenir. Quantities are limited and available on a first come, first served basis. Throughout the second half of the Nineteenth Century, the National Grange's presence in Washington, D.C. came in the form of the homes of founders Oliver Hudson Kelly, John Thompson, and John Trimble. As Grangers began to recognize the need for a more permanent voice in Washington, members began advocating for permanent headquarters. Thomas Atkeson, Former National Overseer and first Legislative Director for the National Grange, worked out of a location at 303 Seventh Street, now regarded as the first official headquarters of the National Grange. But the organization was growing at an unprecedented rate, proving the location on Seventh Street quickly inadequate. In 1921, National Grange took occupancy of the second floor of a building owned by the National Bank of Washington. That space had also become too small to accommodate the growing organization, so in 1936, the National Grange moved into what would be its last rented space at 1343 H Street, NW. 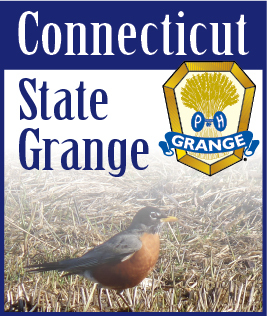 In 1943, the first headquarters owned by the National Grange was purchased. Located at 744 Jackson Place Northwest, the new Grange home stood eight stories tall and faced the White House from across Lafayette Square. Having the building gave the National Grange added credibility, and it was right where National Master Albert Goss and others felt it belonged. Although the location of the headquarters on prime real estate was good for the Order, it also made the building the envy of certain agencies within the Federal Government that had other plans for the block. Under a law known as the Public Buildings Purchase Contract Act of 1954, the GSA acted on their perceived power to condemn and seize any private property needed for the conclusion of a project. The GSA attempted to seize the property at Jackson Place, but the National Grange was not going down without a fight. On July 24, 1958, the National Grange and the Federal Government reached an agreement. The GSA and the National Grange would switch land sites, and a new Grange headquarters would be built. The Federal Government gave the property to the National Grange on August 11, 1958, as well as an additional $360,000 in compensation. The new and current headquarters had a planned completion of early 1960. The Groundbreaking Ceremony was on January 8, 1959. Master Herschel Newsom and members of the Building Committee turned the first spade of earth. National Officers and representatives of 17 State Granges were present for the ceremony, and by April, work had begun on what was supposed to become a narrow brick structure 110 feet tall in the 1600 block of H Street, NW. Today, due to its prime location, the building rarely has vacant office space. Approximately 45% of the organization's operating budget comes from the building's tenants. In addition, the building provides the organization with an important presence in Washington, D.C.